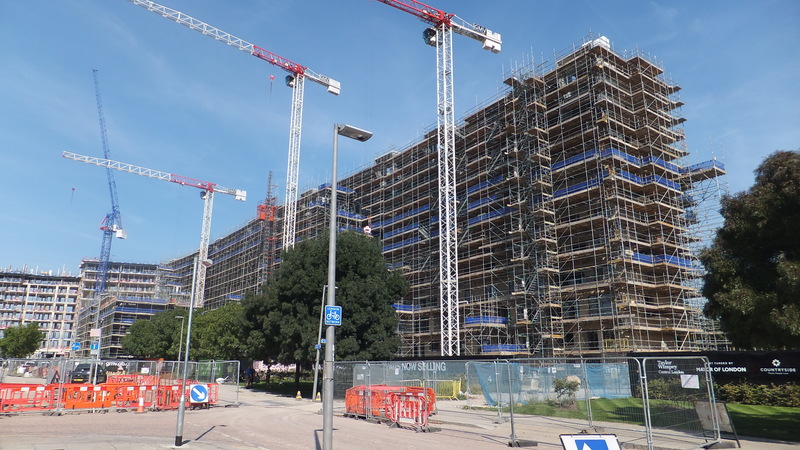 I was intending to put up this post a few weeks ago but some things got in the way, so it isn’t completely up to date, but gives a decent overview of what’s under construction around Greenwich at the moment. The photos were taken the weekend of the Tall Ships festival and cover quite a few developments in Greenwich. I got off the train at Charlton on a beautiful sunny day to walk to the Peninsula before heading to Greenwich town centre to see the festival, and this briefly covers what I saw en route. The first spotted just after leaving the station was the large steel frame of the forthcoming Sainsbury’s and Marks & Spencer stores above the hoardings. The first thing to note here is the cycle lane. A fresh lick of paint has been applied but cyclists still have to dice with stopping buses and overtaking cars plus. There appears sufficient land off road to have placed a segregated cycle lane that could have passed behind the bus stop. In addition, as a main approach route for cyclists, a cycle storage area could have been located by this main entrance and approached by a segregated lane. These kind of things are commonly seen on the continent. On a wider level, this development is on the failed model of large out-of-town retail barns located in inner cities, which harms town centres. Shortly after these pictures were taken, the Marks & Spencer just down the road at Woolwich town centre was shut after 100 years. Here at Charlton there’s a building and car park taking up a large swath of land. This is a gross under-uterlisation of land with the housing shortages we have. Under Charlton’s masterplan this area is zoned as retail. A far better option would be mixed-use schemes with extensive housing alongside and above retail. I’ve wrote a bit more about the wider masterplan here at the Charlton Champion site. Development along the lines of many other contemporary projects would have seen substantial housing included. Though a flawed building suffering substantial cost cutting, the Woolwich Tesco model would have been one to follow, with car parking at basement level (this was altered to ground floor at Woolwich Tesco to save money, and explains the lack of shops and dead frontage along the side there), retail above on the next floor or two and then housing above. Ten minutes on the train from Charlton, at Abbey Wood, another new Sainsbury’s superstore is currently going up. This does have car parking below the shop, and an element of housing on one corner. Not enough for my liking, but still a better use of land. Similar mixed-use is seen at Welling Tesco, the proposed Asda at Lee, Asda at Isle of Dogs and many more. Below is the proposal for the Asda at Lee development. Something similar to this facing Woolwich Road, as sites are redeveloped, would be preferable to what is currently happening. The argument that large supermarkets in town centre’s harm local shops is a valid one, but with it currently being very difficult to prevent, the emphasis should be to work within the planning system we have and with developers to include as much housing as possible. It is likely that in the near future both Asda and Makro’s giant sites will come up for development. Replacement with slightly modernised retail barns would be a great waste. In future, housing should be prioritised in this area before closing and demolishing successful businesses in the industrial parks next door, which is Greenwich’s chosen course of action. Of course, that means less prime riverside land. Greenwich After Charlton I reached the south of the Peninsula. 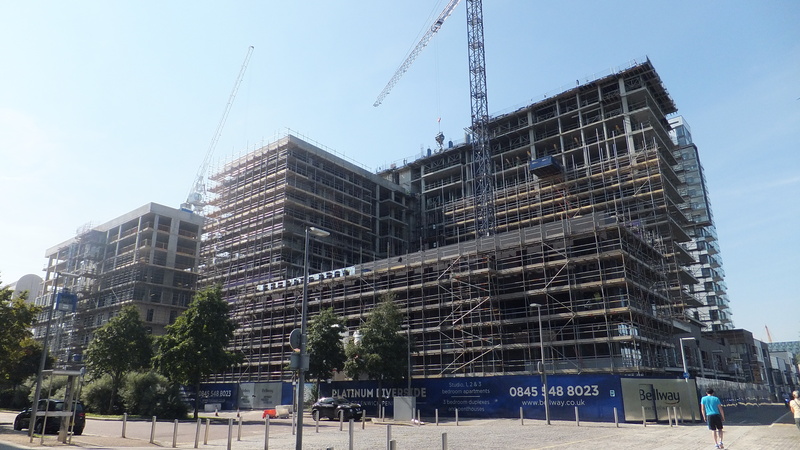 Above is Greenwich Millenium Village Stage 3 from Taylor Wimpey. The first stages are generally good places to be with interesting, attractive housing plus good public realm and streets. A lack of retail however. The only pub nearby is The Pilot Inn. Nothing else for thousands of homes. Not great. I suppose residents can also enjoy the delights of the o2’s chain bars. These are part of 1300 homes currently going up across the Peninsula. Most ‘social’ and ‘affordable’ (a ridiculous term looking at the cost) homes have been placed to the south with the premium units mostly located to the north. These to the south are located next to a large aggregate facility at Angerstein Wharf. 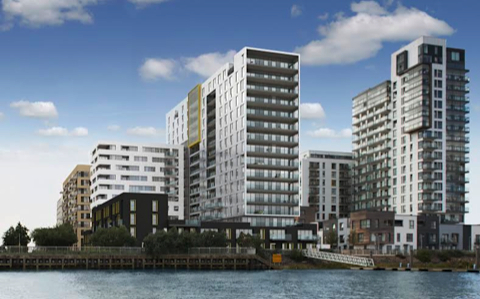 A render of the scheme is below – A couple of minutes away is Bellway’s ‘Platinum Riverside’ (see left). The tower on the right side of the render has been up for a couple of years. It’s the slab like tower and lower rise elements that are going up now. These look pretty poor with low quality cladding, and together are some of the worse buildings across the Peninsula. The horizontal window bands on the lower rise section are something many recent developments had fortunately moved away from. The rather bizarre low rise housing element at the front also appears out of place. Another image of it under construction, with more concrete frame and scaffolding, is below: There’s tons more under construction. The follow-up post will cover Knight Dragon’s buildings slightly north, the hotel by the o2, new attractions beside such as Now Gallery, and then buildings to the west of the Peninsula. Following that there’s buildings in East Greenwich like ‘The Peltons’, a separate block on Blackwall Lane from developers Mulberry Builders, ‘Greenwich Square’ on the old hospital site, and then those in West Greenwich such as ‘Caledonian Wharf’ on Norman Road and ‘Movement’ by Greenwich station. That’s just those under construction now. There’s other proposals quite far along with building starting soon. That Electrical Wholesalers shop is amusing! I bet the developer isn’t happy they haven’t been able to buy that land too. Interesting post – thanks for sharing and I look forward to seeing the next one. 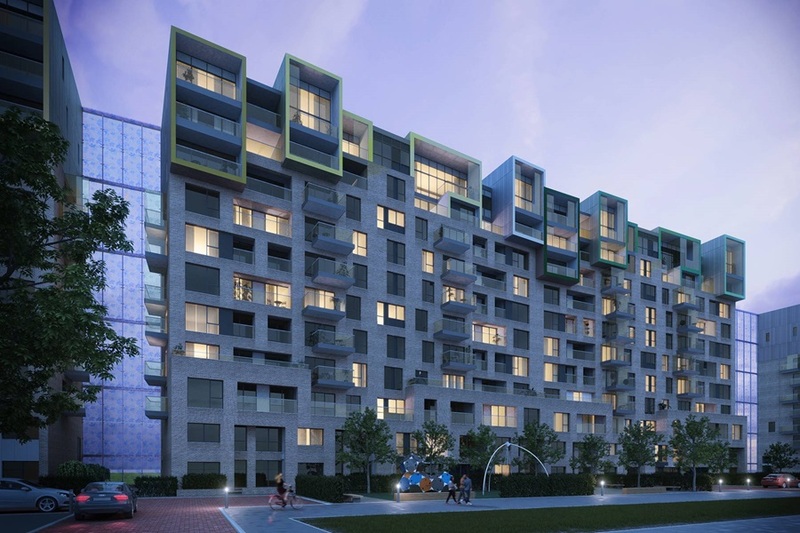 With regard to upcoming developments – are you aware of any plans to redevelop/modernise the Meridian estate near Greenwich town centre? I don’t think Meridian has any plans. It was last renovated in 1999, and is actually better than 90% of estates in Greenwich borough, which admittedly says a lot more about how poor their upkeep is of areas than how good Meridian is. I think it’s inter war. Many were built in that style by the old London County Council. Crossfields estate just over the borough boundary in Deptford is very similar. Plus the paving, walls, fences, landscaping and other street furniture look newer and far better than the vast majority of other Greenwich council areas which havn’t been touched since the 70s, and more modern additions (very few) in those places have continued with the failed and ugly ’70s appearances and design. Greenwich council havn’t ‘got’ urban design for a long time, and place little value on it. Thanks for the background – and I agree completely that Greenwich council just don’t seem to get urban design – even the low cost, common sense stuff like ensuring public furniture / barriers are actually needed and at least visually look similar.